Let’s say you’re trying to remember someone’s name. You’re sure you know it. You think you can remember it any minute, but you’re unable to bring it to mind. I imagine everyon’s familiar with this kind of memory lapses. Actually that happened to me recently. I was trying to remember the name of the book written by a French author, in which a girl called Chloe got a strange disease with a water lily growing in her lung. I definitely knew the title of the book but I just couldn’t remember it. Now, there’s an iditom you can use when you can almost but not quite remember something. 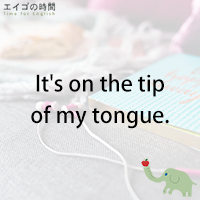 When it happens, people often say “it’s on the tip of my tongue”. Anyhow, let’s practice it together so that you can remember this saying instantly when you can’t remember something.